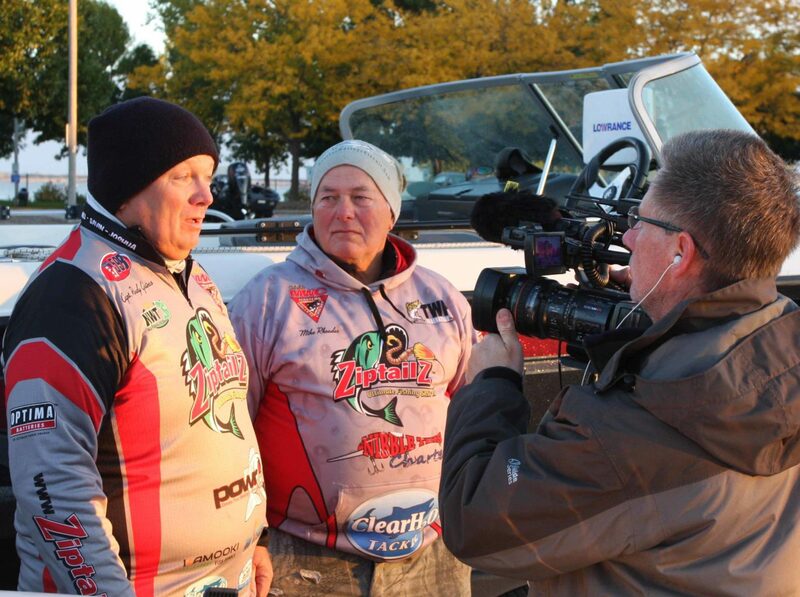 Leaders Randall Gaines and Mike Rhoades discuss day-three strategies in an interview for Federation Angler Television. Green Bay, Wisc.—Oct. 8, 2016—With the Wisconsin waters of Green Bay of Lake Michigan back in play for day three of the 2016 Cabela’s Masters Walleye Circuit’s World Walleye Championship, two-person teams were faced with choosing between a near-certain limit of keepers on the Fox River or rolling the dice for big fish offshore. For leaders Randall Gaines and Mike Rhoades, the decision was easy. “We’re glad to be back on the big lake,” said Gaines, of Salem, Ohio. The pair plucked a 27-pound, 11-ounce limit from the bay on day one to top the 48-boat field competing in the championship, which offers more than $100,000 in cash and prizes, including $15,000 cash for first place, plus a shot at thousands more in sponsor bonuses from Ranger Boats, Abu Garcia, Lowrance Electronics and Okuma. 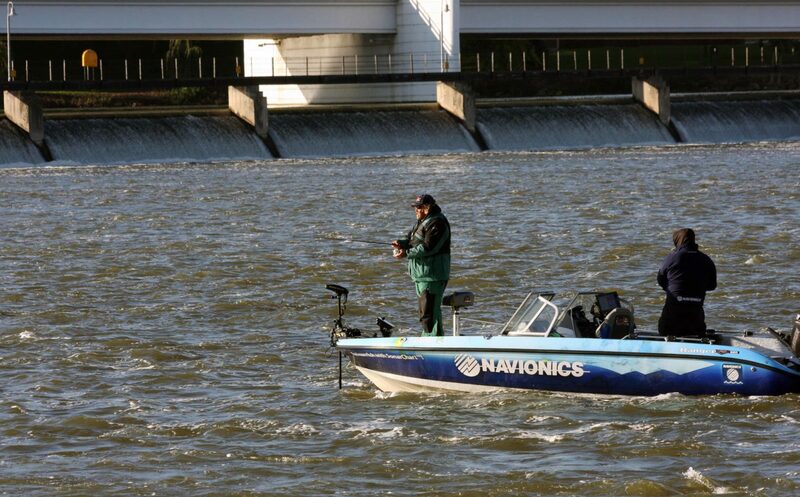 When tournament boundaries were reduced to the Fox River on day two due to gale force winds, Gaines and Rhoades, of South Bend, Indiana, sacked a 5-fish limit weighing 7-02 to retain their grip on the lead with a 34-13 two-day total. The event is far from a blowout, however, as Wisconsin’s Michael Lenarduzzi and Douglas McDonough are nipping at their heels in second place with 33-15, followed by Greg Whitson and Mark Campeau of Ontario with 30-14. While the leaders welcomed a chance to fish the bay, they were less enthusiastic about the weather. “We’re not so glad the temperature dropped 30 degrees,” Gaines laughed. “Win lose or draw, no matter where we end up, just being invited to fish the MWC Championship and having led the field for two days is very special,” added Rhoades. A number of teams chose the Fox River option, including MWC veterans Tommy Skarlis and Jeff Lahr. The final weigh-in starts today at 4 p.m at Green Bay’s Metro Park landing. It is open to the public, and will also be streamed live worldwide at masterswalleyecircuit.com. Under the umbrella of The Walleye Federation (TWF), the Cabela’s MWC is open to avid walleye anglers from all walks of life. The 2017 schedule includes qualifiers on the Illinois River March 17-18, the Detroit River April 7-8, Big Stone Lake April 28-29, the Bay of Green Bay out of Green Bay May 19-20, Lake Winnebago June 2-3, Devils Lake July 21-22, and the St. Marys River Aug. 25-26. Cabela’s, the World’s Foremost Outfitter for hunting, fishing and outdoor gear, is concluding its 15th season as title sponsor of the MWC. Official Circuit sponsors include: Berkley Gulp!, Abu Garcia, Lowe Equipment Attachments, Lowrance Electronics, Mercury Marine, Ranger Boats and The Walleye Federation. Associate MWC sponsors include: AirWave Pedestals, G-Juice, MotorGuide and Okuma. For more information, visit masterswalleyecircuit.com, email info@masterswalleyecircuit.com, or call (580) 765-9031.